Gwen John, the elder daughter and the second of the four children of Edwin William John (1847–1938) and his wife, Augusta Smith (1848–1884), was born in Haverfordwest, Wales on 22nd June, 1876. Her father was a solicitor and her mother, an amateur artist. Her brother, Augustus John, was born in 1878. After her mother's death when Gwen was eight, the family moved to the small resort town of Tenby. Her brother's biographer, Michael Holroyd has argued: "Queen Victoria had gone into perpetual mourning after Prince Albert's death in 1861, and Edwin, who never remarried and who in his late thirties retired from practising as a solicitor, seems to have felt it proper to follow her example within the dark interior of Victoria House. The atmosphere in which his two sons and two daughters grew up was loveless and claustrophobic. Their father had cautioned his children never to go out on market days in case they were captured by the Gypsies.Her brother told his friend, Nina Hamnett: "We are the sort of people our fathers warned us against!" According to her biographer, Cecily Langdale: "She was educated first at home by governesses and subsequently at Miss Wilson's academy in Tenby and Miss Philpott's educational establishment in London. The household in Tenby was a sombre one, and all four John children escaped its repressions at their earliest opportunity." 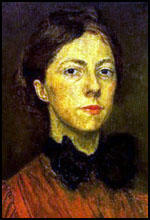 In 1895 she moved to London where she attended the Slade School of Art. Gwen was taught by Frederick Brown and Henry Tonks. Other students at the Slade at the time included Ambrose McEvoy, Ursula Tyrwhitt, Ida Nettleship and Gwen Salmond. She lived with her brother, Augustus John. He later recalled in his autobiography, Chiaroscuro: "It wasn't long before my sister Gwen joined me at the Slade. She wasn't going to be left out of it! We shared rooms together, subsisting, like monkeys, on a diet of fruit and nuts. This was cheap and hygienic. It is true we were sometimes asked out to dinner, when, not being pedants, we waived our rule for the time being." 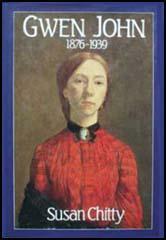 The author of Gwen John: An Interior Life (1989) has argued: "Her lifelong tendency to form intense and smothering sentimental attachments to both men and women, by their very nature doomed to failure, became apparent at this time. Seemingly meek and self-effacing, she was in fact strong-willed and fiercely passionate. In appearance she was slight and pale, her brown hair carefully restrained, her dark eyes solemn and watchful; however... the firm set of her slightly receding chin hinted at her intransigent nature." Gwen John exhibited for the first time in the spring of 1900 at the New English Art Club. In March 1903 she and Augustus John had a joint exhibition at Carfax & Company. However, she worked very slowly and contributed only three pictures to her brother's forty-five. Michael Williams has argued: "Their relationship was non-competitive and highly affectionate. Although critical of Gwen’s evident unconcern about her health, Augustus was foremost in appreciating her art. What his own work owed in technical mastery, he felt that Gwen’s pictures more than compensated in interior feeling and expressiveness." Augustus John introduced Gwen to John Quinn, the American lawyer and collector, and he provided her with a stipend and purchased any picture she offered. Cecily Langdale has argued: "He ultimately acquired about a dozen paintings and scores of drawings. Equally valuable was Quinn's emotional support, which he provided from the start. He encouraged her to view exhibitions and enlarged her acquaintanceship by introducing her to his friends, including Picasso, Braque, Matisse, André Dunoyer de Segonzac, Constantin Brancusi, Maud Gonne, Henri-Pierre Roche, and Augusta, Lady Gregory. Jeanne Robert Foster, Quinn's companion, became a close friend. Her relationship with Quinn... coincided with her period of greatest artistic productivity, for which he was surely at least in part responsible." In March 1922 she wrote to Quinn: "I am quite in my work now and think of nothing else. I paint till it is dark … and then I have supper and then I read about an hour and think of my painting. … I like this life very much." Quinn's death in 1924 closed this happy period and brought genuine financial insecurity. She painted less and, without Quinn's encouragement, was less eager to exhibit. n 1926, Gwen John established an obsession with Vera Oumançoff. According to Michael Williams: "She had been profoundly disturbed over the death of Rilke, and wondered whether one ought to pray for his soul in proximity to the region where he expired. After the initial encounter outside the parish church in Meudon, however, she fastened her attentions on Vera with the same fevered intensity she had on Rodin. These affections... were regulated by Vera who insisted that Gwen desist from her torrent of impassioned letters, and write only once a week. Thus began a series of letters and accompanying drawings sent by the artist to Vera Oumançoff, usually on Monday, from January 1928 to July 1929. Vera saved these drawings, although evidently she did not appreciate their artistic value.... By 1930, Vera felt the need to sever the relationship entirely, for she believed that the spiritual welfare of Gwen John demanded a new, harsher discipline." Gwen John fell ill and died in Dieppe on 18th September 1939 in the Hospice de Dieppe.